[TRANS] 130804 Broadcasting Company Reps Who Respond To JYJ’s Appearance Requests Ask For Anonymity… Why? When will we be able to see JYJ on TV again? Though they’ve continually released new music, we have never seen them on any major music program, and we’ve yet to see them on a variety show, which are now deemed the best source of advertisements for idols. Even nameless rookies and old actors appear on variety shows, something JYJ can’t do. The voice of the fans requesting their appearance on shows is met with silence. But a new and recent movement in the industry is grabbing the attention of many. The Fair Trade Commission (FTC) came to a verdict on the 24th of July that found SM Entertainment (SM) and the Korean Federation of Pop Culture and Arts Industries (KFPCAI) guilty of interfering with JYJ’s broadcasted appearances and activities as singers. According to the FTC, once the three former members of TVXQ left SM and formed JYJ, releasing their first album in October, 2010, SM and the KFPCAI agreed to stop JYJ from appearing on broadcasted programs and from distributing their music. They then sent an official notice to 26 licensees in the industry. Afterwards, JYJ faced a number of limitations in their activities and they were not even included on the rankings of major music programs. Since submitting their exclusive contract nullification injunction against SM in 2009, JYJ fought a long and hard legal battle against the agency, and the two parties came to an agreement in November, 2012. With JYJ settling all of their problems regarding their exclusive contract with SM and with the FTC coming to a verdict that favored the group, many expected to see JYJ on TV in the near future. However, the three major broadcasting companies have not budged since the FTC’s verdict on the 24th of July. SBS, KBS and MBC’s variety sectors, that are in charge of their respective music programs and variety shows, are not saying much about the possibility of JYJ appearing on their shows. This is not that different from the stance they had before JYJ’s settlement with SM. Why is this so? Requests flooded in for responses from the three major broadcasting companies regarding the possibility of JYJ appearing on broadcasting shows. But the responses that were given were tepid and circuitous, with each and every representative strangely asking for anonymity. When asked about JYJ’s possible appearance on ‘Music Bank’ or any of KBS’ variety shows, a high-ranking representative of the KBS variety sector stated, “Inviting celebrities is the job of the PD. We do know that the FTC have laid down a correction order. For now, we can only make theoretical assumptions about the case. 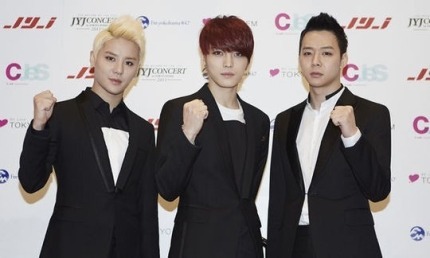 That’s all we can say for now.” A representative of ‘Music Bank’ stated, “Their side (JYJ) has yet to contact us. We have nothing more to say on the matter,” and “Getting requests from fans on our site is something that always happens whenever a new album is released by a singer.” Since Kim Junsu’s new album was released, his fans have been flooding the homepage of ‘Music Bank’ and KBS with requests for his appearance on the music program. Almost as if they had made a deal together, the three broadcasting companies have given nothing but circuitous statements regarding JYJ’s future broadcasted activities. All of the representatives who gave their opinions even said, “I’d rather not have my name stated in the article.” Though some of them stated that they had not received contact from JYJ’s representatives, JYJ’s agency stated that they went round all the broadcasting companies to notify them of Junsu’s new album as soon as it was released. Why are the three major broadcasting companies have such a meek and tepid attitude about JYJ’s future activities? What are the representatives so afraid of that has them asking for anonymity? The suspicion of JYJ’s fans, who want nothing but to see JYJ on TV once more, continues to grow.